Grows in a variety of wet habitats, including marsh, bog, wooded floodplains. 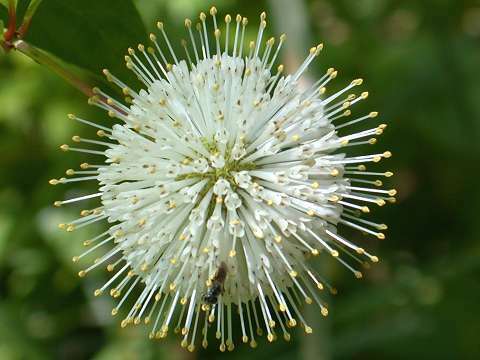 Where it is very common the habitat is sometimes referred to as buttonbush swamp. Nova Scotia, New Brunswick and Quebec west to MN, south to Mexico and the West Indies. A medium to large deciduous shrub to 3 m, occasionally developing into a small tree. Terminal bud frequently absent. Leaves opposite, occasionally whorled, simple, lanceolate, entire, upper surface shiny green. Flowers in dense, round clusters; corolla white, funnelform, with 4 short lobes. Seeds 4-sided (like elongated corn kernel) tightly packed in a round cluster. Flowers late June into late August. An attractive shrub of wet soils. Makes a good specimen for a moist spot in the landscape. Pruning helps maintain a good shape. Most happy growing at the edge of the water but will tolerate drier soils to some extent.